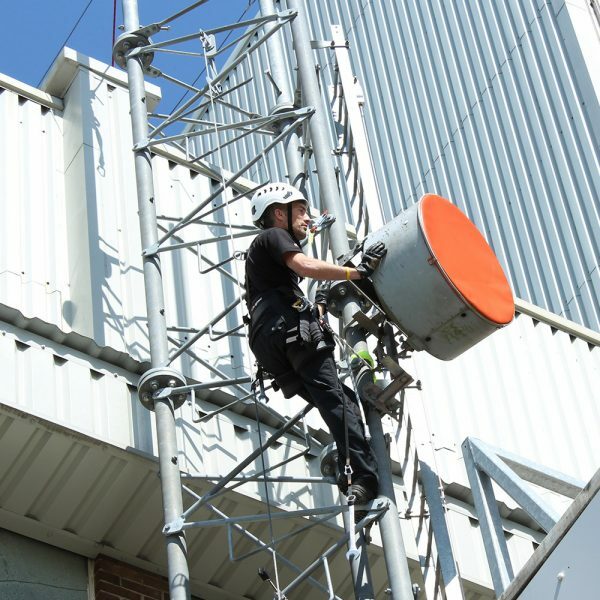 ARQIVA Gateway approved training provider – MATS course for persons who are starting out in the Telecoms industry and are required to access all parts of a typical structure and perform the required foreseeable rescues. Provides a range of skills for climbing, including the use of all safety equipment and tower rescue. This Tower Climbing course provides a range of skills for climbing, including the use of all safety equipment and tower rescue. Includes the elements of a Safe System of Work, including equipment selection and pre-use inspection, use of tools, risk assessment, method statements and emergency procedures. Evacuation and rescue are practised at height. Basic climbers will be expected to work almost entirely from within the confines of protected areas but are able to move to exposed areas if necessary to carry out straightforward work tasks. Complies with the climbing elements of MOD JSP375 Advanced Climber. Legal, personal and medical requirements for work at height. Risk assessment, method statements, emergency procedures. Climbing techniques, ladder and structure. Climbing techniques in exposed locations. Restraint, work positioning, fall arrest systems. Use of ropes and knots. Safe use of Personal Protective Equipment. Proper execution of simulated work task. Ensuring safety of self and others. Climbers should undertake a proper medical examination before undertaking work at height. Candidates should be comfortable with exposure to height. Must speak fluent English. Physical fitness with no contra-indications for working at height. A self-certified statement of reasonable medical fitness will be required, prior to attendance.